Bridgeport will hold its annual Wage & Hour Litigation & Management Conference on December 9, 2016, at the Millennium Biltmore Hotel. Listen to a diverse faculty as they discuss recent, major developments in wage & hour class action litigation, including Spokeo v. Robins, PAGA, and other issues. Episode 9 of the Class Re-Action podcast is now published (a bit earlier in the day than usual). Episode 9 guests are Jennifer Zargarof of Sidley and Eric B. Kingsley of Kingsley & Kingsley. Show topics include discussions of Concepcion v. Amscan Holdings, Inc. (Feb. 18, 2014), Martinez v. Joe's Crab Shack Holdings (now held for Duran), and Williams v. Superior Court (Allstate Ins. Co.), 221 Cal. App. 4th 1353 (Dec. 6, 2013). As a reminder, the first four episodes now qualify for MCLE credit if you need that, and it shouldn't be long before all shows are eligible for MCLE credit. So I finally got off my duff and obtained MCLE credit approval from the California State Bar for more episodes of the Class Re-Action podcast. You can now purchase credit, in one-hour blocks, for episodes 1 through 4. They are now all priced to be highly affordable. They aren't intended to be a profit-center, just an offset to hardware costs for each episode. Now you can be entertained (I hope) and score some credit for California MCLE at the same time. I will get the rest of the episodes up for credit as soon as I can. Since I need to capture bar numbers as a MCLE provider, the checkout now includes a form to collect that information. I won't be providing that information to anyone other than the State Bar, if they decide they want it. Speaking of the Class Re-Action podcast, we will be recording another episode this Sunday. If all goes well (and this miserable computer doesn't explode), I will have it published the same day. Paul Bland, of Public Justice, was more than up to the challenge of explaining the intellectual dishonesty and depravity of the Supreme Court's most recent hatchet job on employees and consumers. Well, he didn't use those words, so consider that my editorial paraphrase of what happened in Episode 3. Available for download, streaming audio in your browser and through iTunes. Now that I have State Bar approval of Episode 1 as MCLE, I have flipped the switch on the MCLE store. If you listened to Episode 1 and feel like picking up an hour of credit for your time, you can purchase the credit here. Remember, you don't have to do anything to listen to the Class Re-Action podcast, but any time that you would like credit for episodes that you have listened to, you have that option open to you. I will have more announcements related to this auspicious event, but I just received my notification today that the Class Re-Action Podcast, Episode 1, has been approved for MCLE credit. The short version is that I have been preparing to move this blog to the newer Squarespace v6 platform to accommodate my ability to offer MCLE credits through the blog. I will soon be switching to the new platform, and the look will change a bit when I do implement the switch. For what? For an exceptional class action symposium, that's what. I appreciated the fact that the program focused on advanced and current topics, and didn't attempt to provide a primer on basic class action litigation. I also had fun attempting to disabuse my co-panelist of his many strange notions about Concepcion and arbitration clauses, but I think I failed to cure him. After returning from a week of travel for work, I wanted to post a quick comment about the 4th Annual Class Action Symposium presented by Consumer Attorneys of San Diego. After speaking at the Symposium, I can now say quite confidently that it contains top-tier material for class action practitioners. 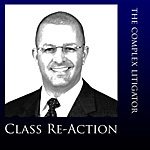 Almost any class action practitioner will benefit in some way. I regret that I could not attend the second day of the Symposium because of my travel schedule. Make a mental note to attend the Symposium next year. You will be glad you attended this Symposium, and not one targeted at a more basic level of experience. The 21st Annual Golden State Antitrust and Unfair Competition Law Institute is now open for registration. This informative MCLE program is sponsored by the State Bar of California, Antitrust and Unfair Competition Law Section. The full day Institute (followed by the Antitrust Lawyer of the Year Award Dinner) will take place on Thursday, October 27, 2011 at the Westin St. Francis Hotel in San Francisco. View the complete program here. View a printable brochure here. I attended this program last year as a speaker, and I can tell you from personal experience that the panels are heavy-duty stuff.